Set on top of a mountain facing the Black Sea in Turkey’s Trabzon region, Cold of Kalandar tells the tale of daily life for a family who breeds livestock, spun together with the formidable reality of nature. In his second feature film, documentary filmmaker Mustafa Kara has created an honest portrayal of a family’s earnest life in a home without electricity or running water. Highly praised has been his ability to capture such a large-scale depiction of nature within the relentless mountains, without using any artificial effects. He visited Japan together with his staff. Please tell us about how the film came about. Director Mustafa Kara (Director Kara below): When I was a child, there was a person close to me who was much like the protagonist in the film. I thought that there are some close similarities between modern society and the grandeur of nature, and using that person’s way of life as a reference, I put together my plan for the film. Bilal Sert (Sert below): We wanted to illustrate a comparison between the struggles of daily life for those who live in cities, and those who live in nature. The director created the original story, and after that, I wrote the screenplay. The place where such overwhelming shots were taken, is this a place where you [Kara] actually used to live? Director Kara: I decided to film in the villages of Macka, Trabzon, on Turkey’s Black Sea coast. It’s a mountainous region that is right near the sea. I spent my childhood in an environment similar to that, but I didn’t choose this area for sentimental reasons. I felt that this place was most suitable for expressing the main character. How did you both [Kara and Sert] cooperate while the story was being written? Director Kara: Bilal was my university professor. So when I had the idea for this film, I brought it to him and we developed the story together. From what point was the producer involved? Nermin Aytekin (Aytekin below): From the beginning. Sert: We all know each other normally. She had experience as a producer, so we brought her into the group from the beginning. She really contributed a lot. Was Şişman envisioned as the lead as soon as the screenplay was finished? 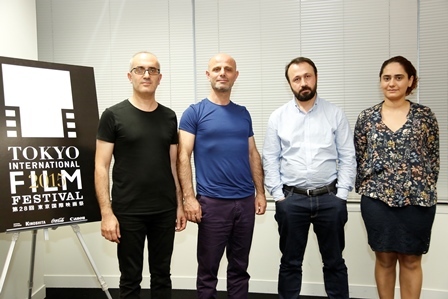 Haydar Şişman [Şişman below]: The director was a student of mine. I had heard that the screenplay was completed, but at the beginning I wasn’t a candidate for the role. They tried different people but it didn’t go well, so in the end I took the part. So there are two professors?! Şişman: I’m an elementary school teacher. Sert: I teach visual arts and sciences (film, TV and radio) at a university. This film has scene-after-scene of incredible shots. What kind of difficulties did you have while filming? Director Kara: There was the elevation of the mountain, and the battle with nature. In order to get realistic footage, we had to wait for natural conditions to sort themselves out. This film was made over the course of all four seasons, and you can’t control nature. Even if things don’t go according to plan, and even if the budget changes, it’s still necessary to coordinate according the weather and natural conditions. In the beginning we thought to film for two or three weeks during each season, but each time it took over one month. In total, the filming took five or six months. Shooting in the mountains meant that we had to repeatedly go back down. What did it feel like to be directed by one of your former pupils? Şişman: He’s been the type to give focus to passion and enthusiasm ever since he was a child. Even with filming he kept the level of enthusiasm high, and although we did at times get tired, that became energy that was dedicated to producing the film. It was a strong scenario, and a strong character. To survive in the middle of nature, strength is essential. What did it feel like to direct your teacher? Director Kara: We didn’t come into it from a student-teacher stance, we approached it with the attitude that we are cooperating together for a work. I treated them the same as I did other actors. Of course in a proper setting he is a teacher, so it would be necessary to be respectful, but that doesn’t mean that he gets some kind of special treatment. On top of that, because they’re both “teacher”, I was able to demand impossible from them. Once finishing the film they’ve been good friends. How was the collaboration with Hungary decided? Aytekin: When the screenplay was finished we were looking for investors, and a Hungarian investor took a liking to the film. Do you have plans to make another film together as a team? Sert: I think we’re going to begin soon. It’s a story about a woman who is waiting for a face transplant.